The Blue Horizon and Captain Jim Sharp have proven over the years that he can put you on the fish. Whether it's local 3/4 day fishing at the Coronado Islands, overnight trips to San Clemente Island, or Offshore Tuna trips. Jim and his crew have the experience and knowledge to make your trip a memorable trip. Over the past few years the Blue Horizon has produced quality fish counts for his anglers. The Blue Horizon has recently been upgraded with the latest side scanning sonar and fish finders. The Blue Horizon is available for Hydrographic Survey, Oceanographic, and Fisheries research charters. The vessel is equipped with computerized twin diesel engines, a 30kw generator, and live tanks/refrigeration for specimen preservation. Blue Horizon has a full galley/sleeping accomodations for up to 14 passengers for multiple day trips in the Southern California/Northern Baja area. Blue Horizon Boat The Blue Horizon and Captain Jim Sharp have proven over the years that he can put you on the fish. Whether it's local 3/4 day fishing at the Coronado Islands, overnight trips to San Clemente Island, or Offshore Tuna trips. Jim and his crew have the experience and knowledge to make your trip a memorable trip. Over the past few years the Blue Horizon has produced quality fish counts for his anglers. The Blue Horizon has recently been upgraded with the latest side scanning sonar and fish finders. The Blue Horizon is available for Hydrographic Survey, Oceanographic, and Fisheries research charters. The vessel is equipped with computerized twin diesel engines, a 30kw generator, and live tanks/refrigeration for specimen preservation. Blue Horizon has a full galley/sleeping accomodations for up to 14 passengers for multiple day trips in the Southern California/Northern Baja area. The Blue Horizon and Captain Jim Sharp have proven over the years that he can put you on the fish. Whether it's local 3/4 day fishing at the Coronado Islands, overnight trips to San Clemente Island, or Offshore Tuna trips. Jim and his crew have the experience and knowledge to make your trip a memorable trip. Over the past few years the Blue Horizon has produced quality fish counts for his anglers. The Blue Horizon has recently been upgraded with the latest side scanning sonar and fish finders. 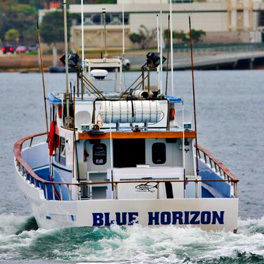 The Blue Horizon is available for Hydrographic Survey, Oceanographic, and Fisheries research charters. The vessel is equipped with computerized twin diesel engines, a 30kw generator, and live tanks/refrigeration for specimen preservation. Blue Horizon has a full galley/sleeping accomodations for up to 14 passengers for multiple day trips in the Southern California/Northern Baja area.